The Zapalac family of La Porte, Texas knows their Rat Terrier–Chihuahua mix is a very spirited little guy. Even with a bad hip, the pooch carries himself with a personality big enough for his very big name — Cujo. Monday morning little Cujo found himself in a very scary situation after escaping from his home through a cracked door. One of his owners, Jeremy Zapalac, put together a search party, scouring the neighborhood for Cujo. “We spent the whole morning, about an hour, looking for him,” Jeremy says, but to no avail. He and his family knew he had to be out there somewhere, lost and scared. When the weather took a turn for the worse, the Zapalac family knew they’d need to find Cujo — and quick. “It started pouring down rain. And he hates water,” Jeremy explains. Meanwhile, La Porte Police officer Kyle Jones was driving down Spencer Highway, a busy thoroughfare that runs through the center of town, when he spotted a small dog limping quickly along the highway, darting through lanes of traffic. Officer Jones knew he had to come up with a plan to save the little guy — and fast. “He’s not going to make it if I don’t do something,” Jones remembers thinking. Knowing the dog could get hit by a passing vehicle any second, Jones hit his lights and spun his car around, blocking oncoming traffic on the busy highway. The caring officer hopped out of his squad car and called to the scared pooch, hoping to coax him off the road. 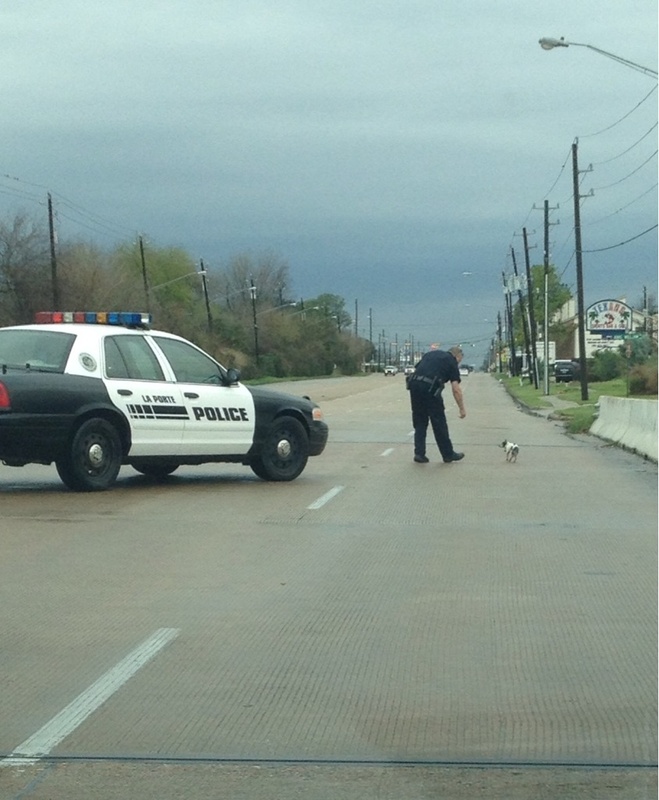 Sure enough, the tiny Chihuahua mix waddled over to Officer Jones, happy that someone had come to save him. Reddit user MissEmKay was in one of the stopped cars on Spencer Highway, and she snapped a photo of the touching rescue. The photo has earned over 12,000 “up” votes on Reddit since it was first posted, people praising Officer Jones for his act of kindness. Jones was able to return a shivering Cujo to his relieved family that same day, thanks to the dog’s identification tags. Later that afternoon, the Zapalacs, grateful for Officer Jones’ efforts in saving Cujo, sent a heartfelt email to the La Porte Police Department. “Just wanted to send a big thanks for the kindness shown to my ‘4 legged’ son this morning!” the email begins.